Clive has been giving talks since February 2013 and these have been recorded. The first series was called 'Meeting Mr Gogus' - the mysterious impulse that determines the lives of those drawn to a more conscious life. There followed a series of meetings about 'The Psychological Life' that we normally lead and the crisis now confronting this civilisation. The escape from the psychological life was then explored in the 'Course in Conscious Living'. This was mapped out as the discovery of what it is to be a True Individual - including the consequences for any rational explanation of existence; the process of taking 'The Next Step' in order to allow the coming of the new; the recognition of how self-centred you are; the importance of standing your ground against the pull of the psyche; and finally how to be what you are more often than who you are. A Course of Seven Lessons recorded at classes with the Taunton Chi Gung Group January-February 2019. Each recording is around 50-60 minutes long and includes exercises and meditations, with instruction in how to breath in chi and increase your awareness of the space in your body. The first class is free. The rest of the course is available in two bundles of three mp3s. Please note that the recording quality improves as the series continues. Nei Gung: Two, Three and Four The primary conscious connection, scanning the energy body, drawing chi from the breath, the seated presence, dropping the mask of personality, working with the chi to free sadness and anxiety in the upper burner. Nei Gung: Five, Six and Seven Increased awareness of energy circuits in the body, opening up inner space, working with the power of chi to deal with reservations and dread, breathing from the middle burner, resonance, delegating the breathing to accumulated chi, the residence of chi in the lower burner, the fire that consumes the past, the Rod of Authority, the Ring of Unity and the Orb of Power. Fireside Talks Concerning the tension of living, the reduction of stress and the commonly-held but secret belief that 'there is something wrong with me'; and much more besides. Talks One, Two and Three (bundle of all three or get them separately). How to increase and develop your perception of chi using 'chi breathing'. An outline of the basic practice. Participate as you listen. Using the resonance of vocal sound to stimulate your chi, balance it in the energy centres of the body and enhance your wellbeing; developed from the traditional Chi Gung practice of The Six Healing Sounds. Listen and then join in as the group learn to make the sounds for themselves. Each sound is repeated several times to allow you to absorb the resonance and experience the benefit. A Weekend Seminar Recorded at the Sopukka Centre near Helsinki, Finland, March 16-18 2018. This is an overview of the Course in Conscious Living as it had developed over the previous three years - how to escape from the troublesome psychological life, engage more consciously with 'the real you' and see your life in the bigger picture of life's purpose. The Course helps you transcend the main features of the psychological life enough to become a True Individual. Read more about the original Course here. There are eight mp3s bundled in this set of recordings, running for between 50 and 128 mins - 11 hours of material in all. Whether you listen to them in real time over one weekend or dip into them a bit at a time, there is a mass of content here that will bear repeated listening. If you attended the original event at Sopukka, email us to get a discounted price of £50. An Introduction: Facing Reservations An evening talk at Pitsku Culture Church, Helsinki on 20 November 2015. 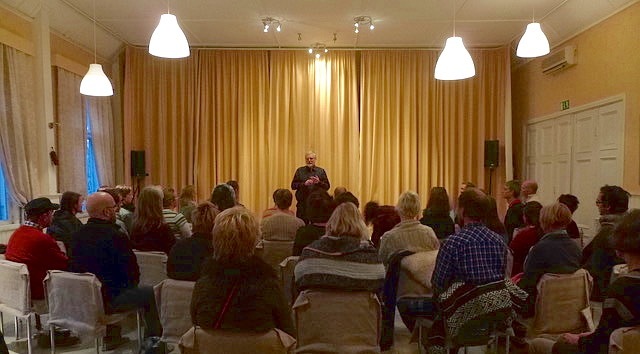 Confronting Dread A Sunday afternoon talk at Pitsku Culture Church, Helsinki on 22 November 2015. Why we are scared of going into the dark, the black? What strategies can we use to overcome insecurity? The Listening Being A meditation from a talk about being a True Individual. Recorded at The Friends Meeting House, Taunton on 10 April 2016. The End of Rationality This talk concluded an examination of rationality and its limitations for the evolution of consciousness. Why is there no improvement in the human condition, despite the advance of our civilisation? Can you reconcile yourself to a non-rational, more magical perception of life? Recorded at The Friends Meeting House, Taunton on 11 December 2016. Standing Your Ground The last talk in the course. A summary of the main points and advice on how to resist the pull into the past and the future at The Friends Meeting House, Taunton on 16 July 2017. As It Happens: Acceptance Facing up to self-centredness and the roots of the psychological life. Freeing yourself by accepting all you have been. An afternoon talk at The Friends Meeting House, Taunton on 24 September 2017. As It Happens: Allowing Change and the willingness to embrace it. Including meditations on being more spacious. An afternoon talk at The Friends Meeting House, Taunton on 26 November 2017.